Hello fellow maggie lovers. As always, I appreciate you taking the time out of your busy lives to stop by my blog. Your comments are always so appreciated. I'm not sure why I made this card other than the fact that I love this sweet little Tilda and couldn't wait to ink her up. My camera is on the fritz so I had to take the picture with my phone. The colors are not as vivid as they are IRl. 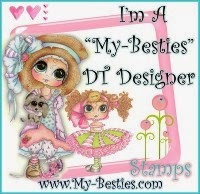 This is adorable....love your stunning card!! Gorgeous colors and a beautifully colored Tilda! Wonderful details! wow what a cutee Adorable!!!! Hi Julie, looove this card! Your coloring and layout are awesome and sooo much cute detail!!! Oh, Julie, this is perfectly peachy keen! I'm dating myself I know - LOL! I love the way you used the MS punch down the edge and your coloring is fabulous. 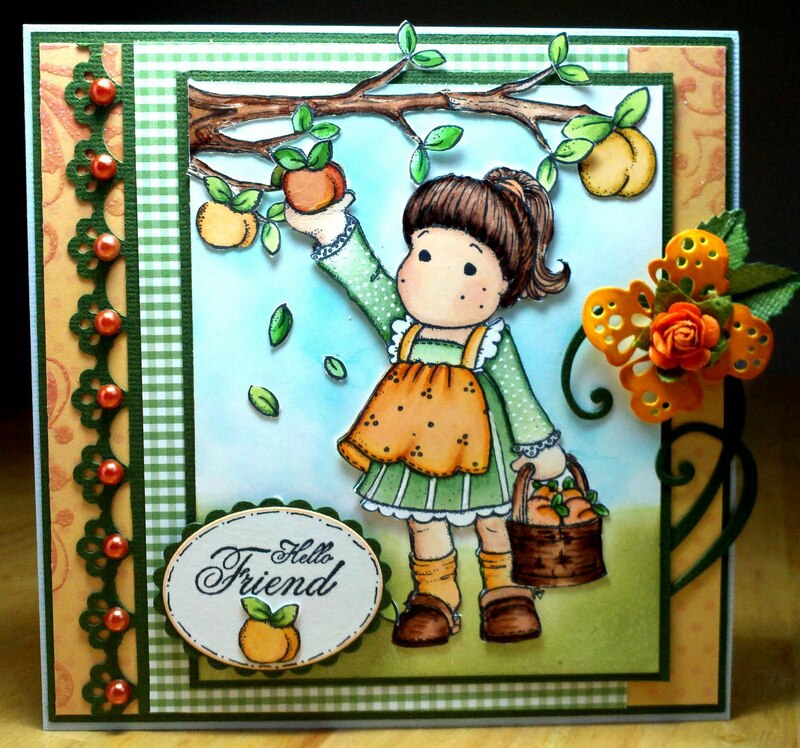 Such cute details and the sentiment with the peach is a delight! Beautiful Card!! Love the colors and your coloring is amazing. Your layout is really nice and I love all the details. Thanks for sharing!! Wonderful card - love the colors and I really like the way you have decorated the left hand side of your card. Nice work! This is adorable....love your stunning card! Your card is absolutely wonderful! Great coloring and very clever scene. Love your details too! GORGEOUS! Love the rich colors. Fantastic coloring and I love that edge punch. Thanks for sharing! Oh my gosh this is SO GORGEOUS! I just LOVE it! The colors are SO vibrant and everything just looks beautiful! What a great card...I have yet to use this image thanks for the inspiration and your coloring is just beautiful. Wow Julie, your card is stunning and your coloring is gorgeous! Love this beautiful scene you created and the striking border on the left with the pearls!